Once again an Indian prime minister has realised that with Pakistan and China, things will not move as he wishes. Sheela Bhatt/Rediff.com deciphers the Chinese leader's visit. Prime Minister Narendra Modi and Chinese President Xi Jinping's statements after their one-on-one meeting of around 30 minutes and the delegation-level meeting, had a touch of reality. In political content it was less emphatic than what was expected, but in areas of economic cooperation, with 12 MoUs signed between the two countries, it was rather satisfactory. This visit was memorable for the hype that it created before and during the visit. In Ahmedabad it was Modi's show all the way. He made Xi's half-day stay in Gujarat colourful and full of photo ops. If one talks about substance, the high profile visit has created promise and hope that the two business-like leaders may really walk the talk in the next five years. Actually, the ball lies in Modi's court, to show that the promised investment of $20 billion is received well and invested efficiently. Where the United Progressive Alliance government failed to initiate and inspire, let us see if Modi succeeds. This visit shows clearly that the next five years are crucial for India-China relations. In the last two days, the prime minister experienced first hand the complexities attached to dealing with China's leadership. Modi is a people's leader and has a thorough understanding of what makes and mars popular sentiments. A headline like 'Even as Xi Jinping meets Narendra Modi, his troops violate India' must have made the prime minister sensitive when he returned to New Delhi after playing host in Ahmedabad. Due to the latest border incursions in Chumar in northern Kashmir, as reported by the media repeatedly and insistently, Modi's statement at the post-meeting media interaction dealt with the border issue emphatically. 'I raised our serious concern over repeated incidents along the border,' the prime minister noted. 'We agreed that peace and tranquillity in the border region constitutes an essential foundation for mutual trust and confidence and for realising the full potential of our relationship. This is an important understanding, which should be strictly observed,' he added. Modi was clearly not underplaying the border issue for the sake of greater economic engagement so that the full potential of the India-China relationship could be realised. Public perception is that Modi went to great lengths to make Xi's visit unprecedented because he is like a businessman who is more eager to cut deals, get money and take the profits home. But the somewhat cautious language of the MoUs on the second day of Xi's visit shows that Modi's foreign policy is in the making and is at a dynamic and evolving stage, where India searches for a new balance to create a win-win situation in multiple engagements with conflicting interests of the participating countries. Before traveling to Washington, DC next week, Modi has sent out signals that India and China are treading slowly, but the engagement is acquiring depth every time a high-level summit takes place. Some experts will debate this demand which has two sides to it. They have argued that if India and China move ahead in exchanging maps of the LAC in all three sectors, will it open up a Pandora's box? What if the border issue gets more tangled than it actually is? Is India ready to take the border talks to the next level, right now? It was always clear that then prime minister Manmohan Singh had limited space on Pakistan and China due to the divided opinion within his Congress party, in Parliament, and in the country. He lacked the backing of popular sentiment too. Does Modi have the political backing within his party, in the Sangh Parivar, and in the country for a final give and take on the border issue? Isn't the status quo a better option when the economy is centre-stage of the India-China relationship? But the counter-argument goes if the border issue is tackled first, the huge financial stakes on both sides will be safer, and to realise the full potential of making business worth billions, the border issue has to be got out of the way. China and India have both shown tenacity over the issue and have indicated that they will settle the border issue on their terms. After the release of the joint statements some critics felt that the border incursions cast a shadow over the Modi-Xi talks, but they should also look at other developments. Just three days ago, India and Vietnam signed seven pacts, including one for cooperation in the strategic oil sector. Both India and China think alike, that they have the freedom to navigate in the South China Sea. China has sensitivities over cooperation on exploring oil in the South China Sea over which it has declared territorial claims. As leaders of two mature nations, Modi and Xi will play the game out. Xi showed his intention in the speech he delivered at the Indian Council of World Affairs where he repeated, as then Chinese premier Wen Jiabao had done in January 2008, support for India's role in the United Nations Security Council. For the last few years it has become increasingly clear that India's relations with Pakistan and China will move slowly. By inviting the leaders of the SAARC nations to his swearing-in, Modi had raised hopes sky high, making even his critics believe that he would take the relationship with Pakistan and China on the fast track, but he is not making sweeping changes yet. If one sees the Xi visit sans hype, it was a continuity of India's China policy. 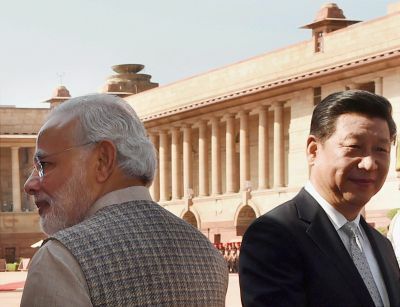 The Modi-Xi joint statement reveals that both leaders decided to initiate nuclear talks, they spoke about Afghanistan, the Shanghai Cooperation Organisation, the Maritime Silk Road, and put their weight behind the Bangladesh-China-India-Myanmar corridor. Its follow-up will test the Modi government. Else, the Modi government's China policy may not be much different from the 10 years of the UPA's China policy. If the two promised industrial parks are raised from scratch in five years in Gujarat and Maharashtra, if the Indian Railways run faster, and if in the power sector Modi's plans to give electricity to every household is matched by China's investment in the supply of machinery, then a lot can be achieved. Official sources said China has promised to help achieve increased speed on the existing railway line from Chennai to Mysore via Bangalore; the Chinese side will provide training in heavy haul for 100 Indian Railways employees; the two sides will cooperate in areas like the redevelopment of existing railway stations and the establishment of a railway university in India; and consider cooperating with the Chinese on a high speed rail project. Ways were also found to resolve the structural imbalance in trade that worries India. China will cooperate with Indian pharmaceutical companies. Both sides have agreed to have stronger links between Indian IT companies and Chinese enterprises, and increasing services trade in tourism, films, healthcare, IT and logistics. The Chinese side has decided to open a new route for the Kailash Mansarovar Yatra, with certain conditions, through Nathu La. Modi may be part of the first group that goes on a pilgrimage through the new route. Modi has been to Kailash Mansarovar thrice. Once again an Indian prime minister realises that with Pakistan and China, things will not move as s/he wishes. Notwithstanding the brute majority in Parliament, even a strong leader like Modi will find that overplaying or underplaying security-related issues can deeply impact the strategic goals in dealing with China and Pakistan. How can one understand the border trouble at Chunar at such a delicate time? Was the incursion by the Chinese army a routine incident highlighted unnecessarily by the home ministry or by the Kashmir government or by the Indian Army or by Indian intelligence agencies, it shows that old habits die hard. Things won't be easy for Prime Minister Modi if he wants to chart his own course in dealing with China and Pakistan. In their own way, Modi and Xi both showed that this is realpolitik. 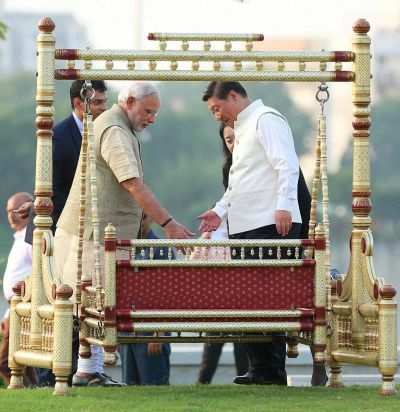 Images: Chinese President Xi Jinping and Prime Minister Narendra Modi. Photographs: PTI Photo.